Alchemy-Spetec provides injection grouting pumps, airless sprayers, and soil stabilization equipment modified for injecting many of our polyurethane resins. 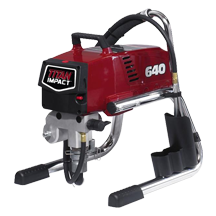 These world-class Titan grout pump systems are essential tools for sealing both small and gushing leaks as well as filling voids behind and below structures. The wide range of injection grouting pumps all feature intelligent tools specifically designed to exceed your needs. 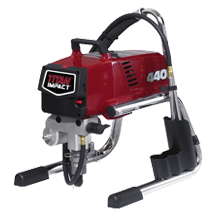 The IMPACT 440 is an advanced injection grouting pump that’s ideally suited for residential, property maintenance and small commercial applications. This high performance electric airless sprayer will apply all standard architectural primer, paints and coatings efficiently. The #1 selling sprayer in the industry is now even better with enhanced features and performance! Weight (skid frame): 35 lbs. The IMPACT 640 continues the climb to increased performance. This mid-range unit is perfect for residential, property maintenance, rental and light commercial applications and is equipped with digital technology for improved efficiency. Sprays: stains, lacquers, enamels, latex and other low and medium viscosity coatings. A step up for projects that requires greater power and output, the PowrTwin 8900 Plus is our best-selling hydraulic piston sprayer, favored by contractors who want to complete large application jobs in record time with high profit margins. 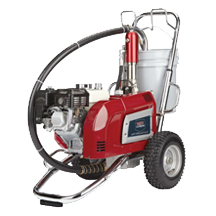 Finally a portable grout pump spray that can handle new construction all the way up to protective coatings.